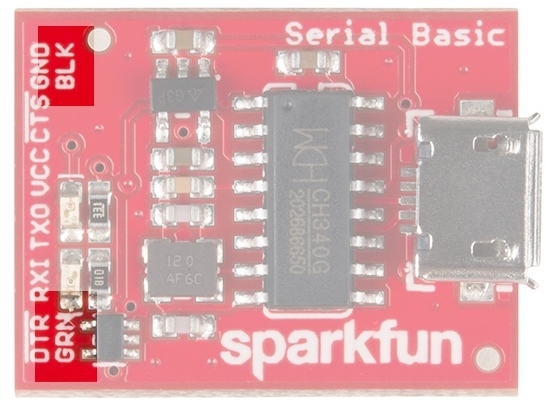 The Serial Basic is an easy to use USB to Serial adapter based on the CH340G IC from WCH. It works with 5V and 3.3V systems and should auto install on most operating systems without the need for additional drivers. 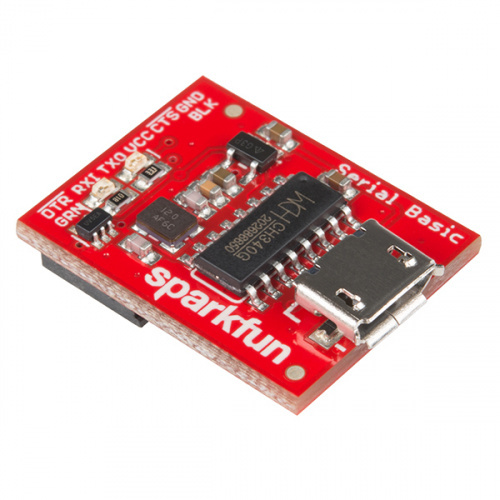 It's a great lower cost option to the extremely popular FTDI Basic. 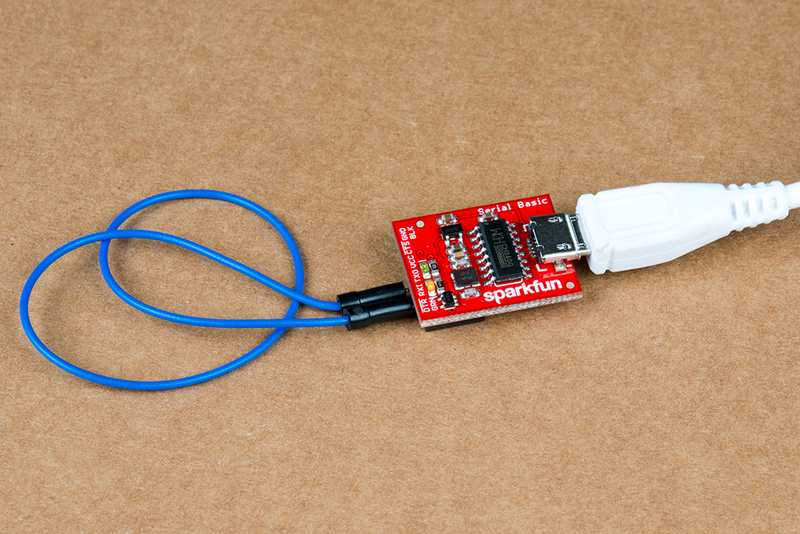 The SparkFun Serial Basic Breakout is an easy-to-use USB-to-Serial adapter based on the CH340G IC from WCH. 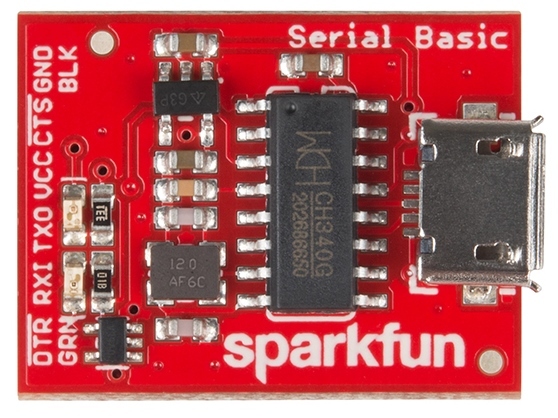 The Serial Basic uses the CH340G IC to quickly and easily convert serial signals to USB. 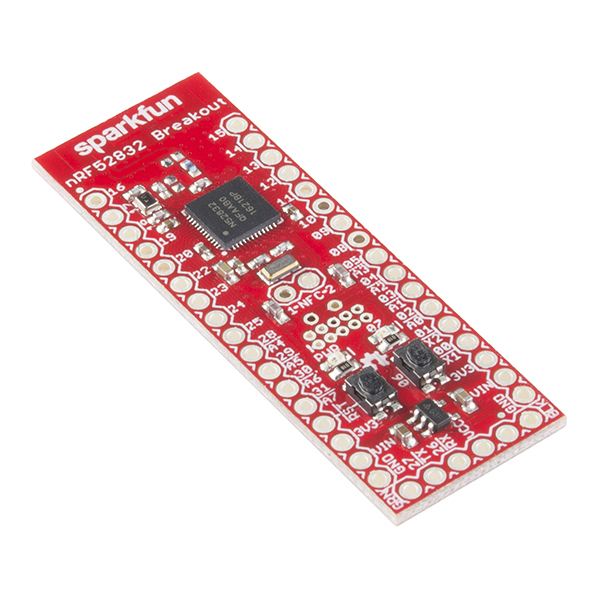 It works great with all of our products including the Arduino Pro Mini, our GPS modules, cellular modules, and many other devices that uses serial communication. At a minimum, you will need the following materials to follow along with the tutorial. You may not need everything though depending on what you have and your setup. Add it to your cart, read through the guide, and adjust the cart as necessary. 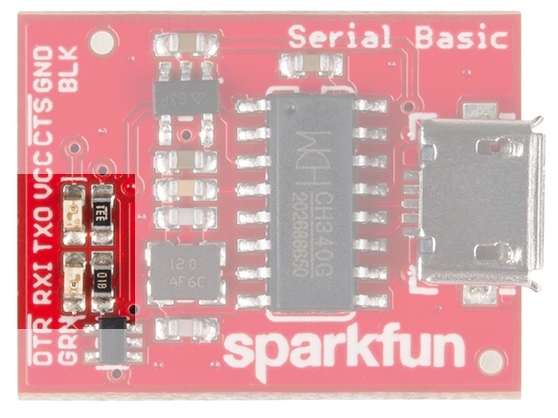 This is an easy board to get started with, but, if you are not sure how serial works or have not used a terminal program before, you may want to checkout the following tutorials. The pinout of the Serial Basic mimics the common DTR/RX/TX/VCC/CTS/GND pinout found on hundreds of FTDI-to-USB derivatives. These GRN and BLK indicators are there to help you align the board properly with products that use this same pinout. The Serial Basic mates seamlessly with products that use the standard serial connection. If you see a board with the BLK and GRN labels, then you know it will be compatible with the Serial Basic. See the GRN and BLK labels on this nRF52832 Breakout? Where did GRN and BLK come from? Way back in 2008, when we created the Arduino Pro Mini, we needed to have a pinout to allow serial bootloading. At the time, the best USB to TTL Serial device was the FT232 Cable. Its unpolarized connector could be flipped either way so we added the words GRN and BLK to the PCB to let folks know how to line up the colored wires. The practice stuck! Now, many boards use this standard. There is a jumper on the rear of the board that controls the output voltage on the VCC pin. By default, the board outputs 3.3V and has 3.3V signals. Changing this jumper to 5V will cause the board to output 5V on the VCC pin with 5V signals. When the jumper is set to 3.3V, the board uses an onboard 3.3V regulator capable of sourcing 600mA. If you attempt to pull more than 600mA, the regulator will go into short-circuit shutdown where it will only output 150mA. 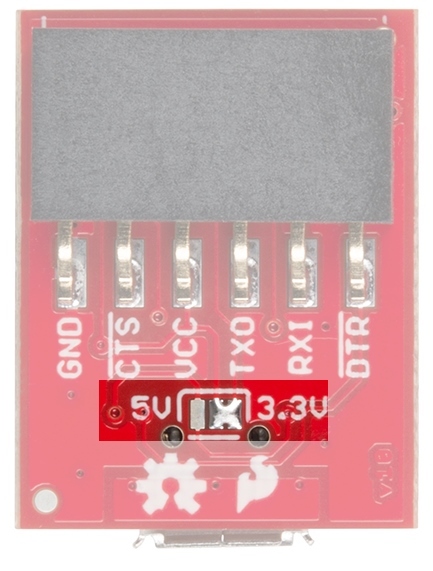 When the jumper is set to 5V, the board will source as much power as your USB port will provide. There are two LEDs on the board connected to TX (Green) and RX (Yellow). This is a quick and handy way to see the serial traffic. To connect the board to a computer, you will need a standard A to micro-B USB cable. 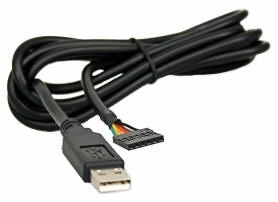 Plug the micro-B USB cable into a USB port on your computer and the other end into the Serial Basic. Your computer should automatically install the necessary drivers and create a COM port on your computer. If you are prompted for drivers, please see the Drivers section. The quickest and easiest way to make sure everything is working is to do a TX/RX loop-back. To do this, insert a jumper wire between TX and RX. Anything that is transmitted from the TX pin will be echoed back to the RX pin. Open your favorite terminal program. Select the COM port that the Serial Basic is assigned to, and connect. When you type a character, you should see each character you type echoed back in the terminal. Which COM Port Do I Need? Most programs will show you a description of the USB device that created the port. To verify that your driver is working, you can use a serial terminal, Arduino IDE, device manager, or command line. Look for the port associated with CH340. 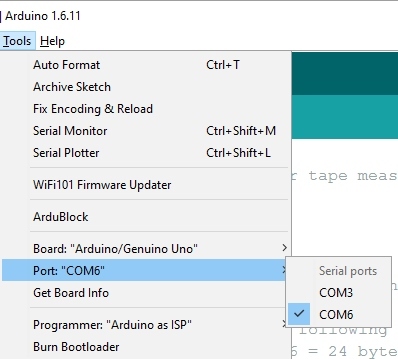 If you're using the Arduino IDE, figuring out which COM port is the one you want is more difficult. 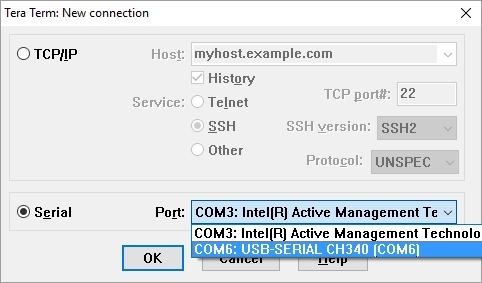 Here's the quick way to figure it out: attach the Serial Basic to your computer, and check which COM ports are listed. In the image below, we have two ports. Now close the Tool menu by clicking on the main Arduino IDE window. Which COM port should I select? Unplug the Serial Basic, and re-open the Tools->Ports submenu. You will see one of the serial ports is missing. That's the one you want! Plug your Serial Basic back in, and use that COM port. 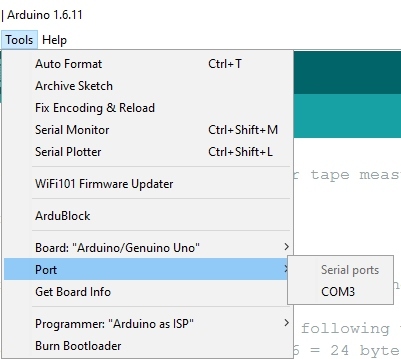 Note: You need to close and re-open the tools menu before Arduino will refresh the port list. If you have the tool menu open simply click on the main window, then click back on Tools -> Port. Screenshot of Window 10 Device Manager with Serial Basic on COM42. Click to enlarge. To verify on a Mac via the command line. To open a command line window, head to your Applications folder, Utilities folder, then double-click on Terminal. Otherwise, press ⌘ (Command) + space bar (Space Bar) to launch Spotlight and type "Terminal," then double-click the search result. Run the following command "ls /dev/cu*" in a Terminal and check for the following changes (your board may show up under a different device name). You should get something similar as shown in the image below. 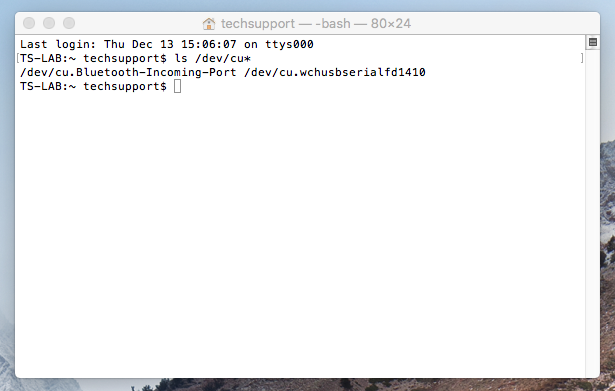 Screenshot of Mac OSX terminal with Serial Basic on cu.wchusbserialfd1410. Click to enlarge. Note: If you are still unsure of how to access the Terminal, watch this video or read this Apple support article. 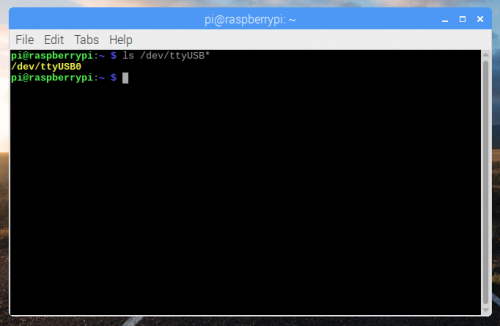 Run the following command "ls /dev/ttyUSB*" in the CLI/Terminal and check for the following changes (your board may show up under a different device name). The CH340C has been tested on Windows 7, Windows 10, OSX High Sierra, and Raspbian Stretch (11-13-2018 release) for the Raspberry Pi. These operating systems have the CDC drivers pre-installed, which means you shouldn't need to install any extra software. However, there are a wide range of operating systems out there, so, if you run into driver problems, you can get drivers here. The CH340G is made by WCH. You can find the latest version of their drivers here, but most of their pages are in Mandarin. If you use a Chrome web browser, you should have the option to have the web page translated. Download and run the executable. Click the "Uninstall" button first, followed by the "Install" button. 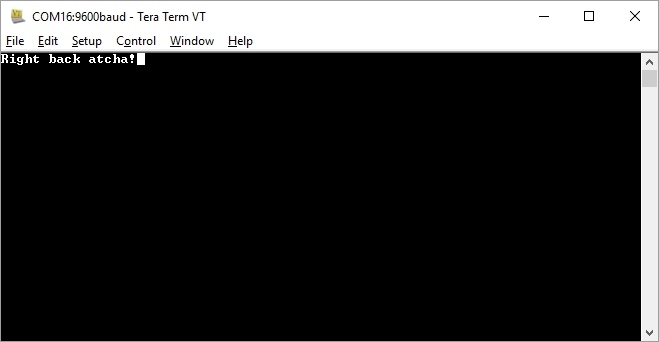 Note: To open the Terminal, open your Applications folder, Utilities folder, then double-click on Terminal. Otherwise, press ⌘ (Command) + space bar (Space Bar) to launch Spotlight and type "Terminal," then double-click the search result. If you are still unsure of how to access the Terminal, watch this video or read this Apple support article. Download and extract the folder. Then, open the "*.pkg" file from the unzipped folder. Unfortunately, we have do not have a Linux computer to test with, but here is the downloadable .zip folder for the CH340 driver. Once you've got serial communication working, you're ready to start playing with serial projects. Consider connecting to a GPS module like the LS20031 (one of my favorites) and watching the serial strings roll by. Or, you can use the Serial Basic to program and debug devices like the Arduino Pro Mini. 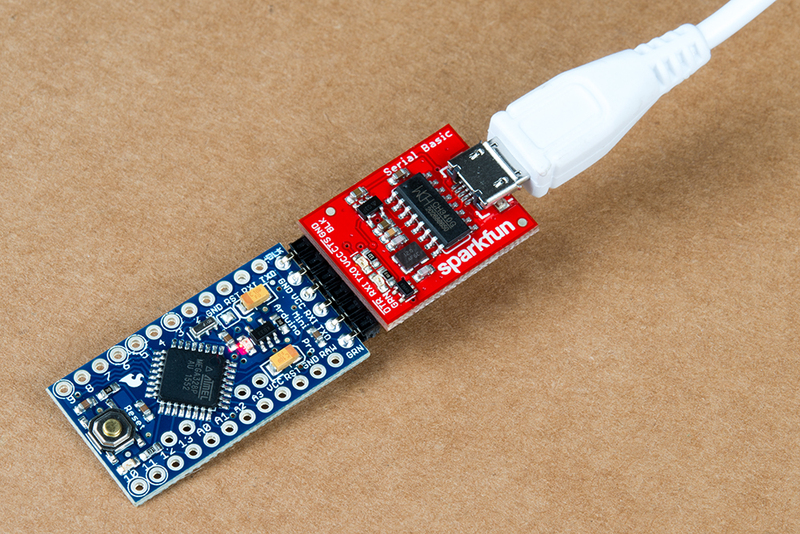 There are tons of devices that use serial to communicate, so go explore! Heads up! The image shows the Serial Basic connected to an Arduino Pro Mini 3.3V/8MHz. If you are using an Arduino Pro Mini 5V/16MHz, make sure to adjust the jumper pad for the voltage selection on the back of the Serial Basic. Check out these other resources for the Serial Basic. Check out these other great SparkFun tutorials.